AMOUNT OF PRODUCT: 0.50 fl. oz. PACKAGING: It’s packaged in a clear plastic bottle with a snap-on top. SIZE: About the size of a bottle of nail polish. CONSISTENCY: Very silky and creamy liquid. SMELL: None that is noticeable. INGREDIENTS: AQUA/WATER/EAU, CYCLOHEXASILOXANE, CETEARYL ETHYLHEXANOATE, PROPYLENE GLYCOL, SQUALANE, BEHENETH-30, MYRISTYL ALCOHOL, PHENOXYETHANOL, GLYCERYL ISOSTEARATE, GLYCERYL STEARATE, BIS-PEG-18 METHYL ETHER DIMETHYL SILANE, GLYCERIN, POTASSIUM CETYL PHOSPHATE, SODIUM POLYASPARTATE, HYDROGENATED PALM KERNEL GLYCERIDES, SODIUM ACRYLATE/SODIUM ACRYLOYLDIMETHYL TAURATE COPOLYMER, METHYLPARABEN, ISOHEXADECANE, HEXYLENE GLYCOL, CYCLOPENTASILOXANE, PROPYLPARABEN, CARBOMER, CETEARYL ALCOHOL, CETEARYL GLUCOSIDE, HYDROGENATED PALM GLYCERIDES, POLYSORBATE 80, SODIUM HYDROXIDE, FRUCTOSE, GLUCOSE, SODIUM HYALURONATE, XANTHAN GUM, TIN OXIDE, CELLULOSE GUM, TOCOPHEROL, ASCORBYL PALMITATE, DEXTRIN, SUCROSE, UREA, ALANINE, ASPARTIC ACID, GLUTAMIC ACID, [May Contain/Peut Contenir/+/-:MICA, TITANIUM DIOXIDE (CI 77891), IRON OXIDES (CI 77491, CI 77492, CI 77499)]. Skin Illuminator by ck one Color is a cool refreshing illuminator that smoothes on easily to a subtle pearlescent finish instantly highlighting skin for a healthy natural-looking glow. Radiant. Refreshing. Ultra comfortable gel formula smoothes on easily for a subtle pearlescent finish with an instant healthy glow. Now, let’s take a look at the product! Here is an unedited proof from a recent shoot that I used the Ck One Color Skin Illuminator on. I used the shade “cool” on the top of the cheekbones, down the bridge of the nose, and on the bow of the lip. Notice how it catches and bounces the light back so beautifully. It’s not “glittery” at all, and just looks like dewy, healthy skin. So far, the Ck One Color line has not let me down; not one bit! This is my favorite highlighter, next to the FACE atelier highlighters. I don’t think I could choose which I like more, quite honestly. I love the texture of this because it is very thick, and stays in place. Some highlighters (like the Benefit one) are too “liquidy” for my taste. When the formulas are too runny, they dry super fast and don’t allow much time for blending — and they matte down, instead of staying dewy, which leaves behind a shimmer, instead of a sheen. I really like this highlighter, a lot! I use it on most photoshoots these days. The only complaint that I have is the packaging. I don’t like that the top snaps on and off. I would prefer a more secure closure for the bottle, as things shift in our makeup kits, and the threat of a spill from this product is always imminent. Other than that, A+ all around! 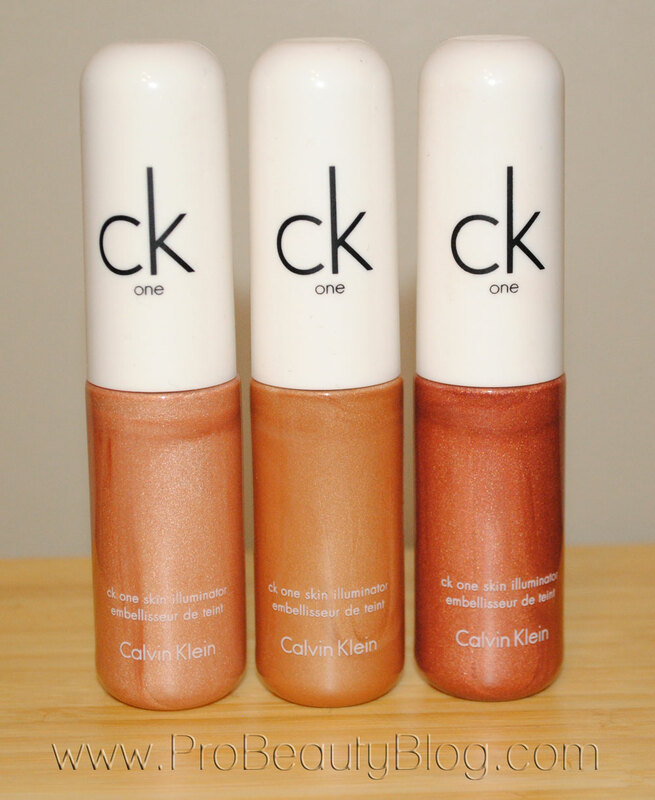 If you would like to purchase the CK One Color Skin Illuminators, click [HERE].